The Newest Webcam Sensation: Bald Eagles! There have been a lot of interesting webcam videos over the years, and live webcams have become increasingly popular as internet connections have gotten faster in the average home, office, and coffee shop chain. Still, live webcams with people can be a dicey proposition, but animals? Forget about it, animal webcams are the future. From puppies to cats listening to Devo, there have been a lot of interesting webcam experiments, but no experiment has gone quite as viral as that of the Raptor Resource Project. 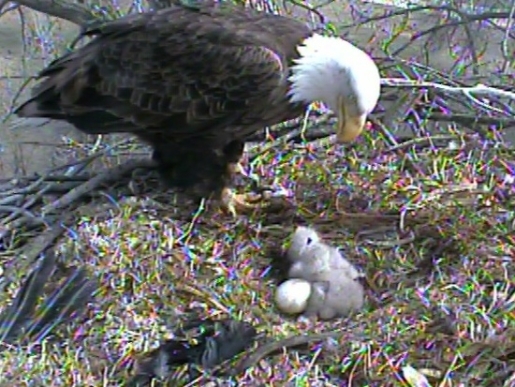 The latest viral video sensation is Eagle Cam, a camera monitoring bald eagle chicks in a nest in Decorah, Iowa. I zoned out watching this video stream for an hour this morning, and it’s incredible. Fans are having fun with the videos captured by the Raptor Resource Project, including making their own mash-up videos. For example, here’s one called “Dueling Corn Husks,” which features the mother eagle’s signature dance move, the Decorah Shimmy.